Youngster Bianca von Bargen from Marine Surf Lifesaving Club gave South Africa’s queen of the sand, Mandi Maritz, some tough competition in a stunning Beach Sprint victory at the General Tire Lifesaving South Africa KZN Provincial Championship. Von Bargen also took first in Marine’s team victory in the Sprint Relay. 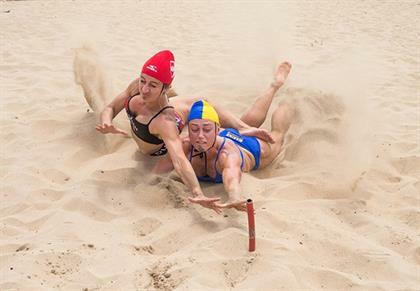 Mandy Maritz from Durban Lifesaving Club and South Africa’s reigning champion narrowly snatched victory from the very talented Von Bargen in the most dramatic of finishes in the Beach Flags. Carmel Billson, in the colours of Marine, teamed up with sister Natalie, Kyeta Purchase, and Von Bargen to win the Beach Relay, but South Africa’s 2017 Female Athlete of the Year, had to settle for second in the Surf Swim (to Alice Edward) and third in the Single Ski, with Kristin Bellingan taking top spot. Among the men, Martin Binedell also from Marine was strong in the surf, claiming victory in the Surf Swim, and he also powered his way to victory in the Run/Swim/Run. Warnadoone’s Landon Kruger won the male Beach Sprint in the absence of South Africa’s National champion Jonathan Rorke. Host club Winklespruit Surf Lifesaving Club was first in the men’s Double Ski. Shane Maquire (Umhlanga Rocks) won the Beach Flags, with Marine’s Dylan Bridger a top three finisher in the Beach Flags and Beach Sprint.